XLK is up +1.04% for the week, up +0.56% for the month, up +1.61% for the year, and up +76.25% since the March 9, 2009 market bottom. XLK has been lagging other sectors and the major indexes. The XLK is a general technology ETF designed to represent the technology sector of the S&P 500, which is approximately 22% of the S&P 500. This ETF also includes the S&P telecommunications sector, which is merged into this technology sector. See the XLK Technology portfolio holdings here. The top 11 holdings currently are: Microsoft, Apple, IBM, AT&T, Cisco, Google, Intel, Hewlett-Packard, Oracle, Verizon, and Qualcomm for a total of 65.86% of the portfolio. This is a very liquid ETF. IYW is up +1.18% for the week, up +1.27% for the month, up +2.76% for the year, and up 91.67% since the March 9, 2009 market bottom. Overall, IYW has outperformed XLK. The iShares Dow Jones Technology Index ETF portfolion holding are here. I like this ETF, but the 50 day average daily volume is about 400,000 shares, compared to XLK of 10.5 million shares. The top 9 holdings are Microsoft, Apple, IBM, Cisco, Google, Intel, Hewlett-Packard, Oracle, and Qualcomm for a total of 62.43% of the portfolio. IYW has traded similar to XLK and is just below its YTD high, which also occurred on April 6. Below is the XLK daily chart for 2010. The intermediate-term signal, the comparison of the 25 day and 50 day simple moving averages, signalled a bull market for the XLK on Thursday, March 18. That is, the 25d sma is greater than the 50d sma. A bear market signal had been in effect since February 5, 2010. The current closing price, the second highest yellow horizontal line, has surpassed the previous 2010 YTD 1-4-10 high of 23.27 and set a new YTD high on 4-6-10 of 23.35. The current price is just below and this is recent resistance. Even earlier resistance is from April 2008 and earlier that year. In addition, there is even more resistance back from late 2006 into early 2007. If XLK can get to about 23.80 or above, a dramatic upside breakout could occur. There are multiple levels of support below. Significant support is the previous 2010 YTD 1-4-10 high of 23.27 just below current price. 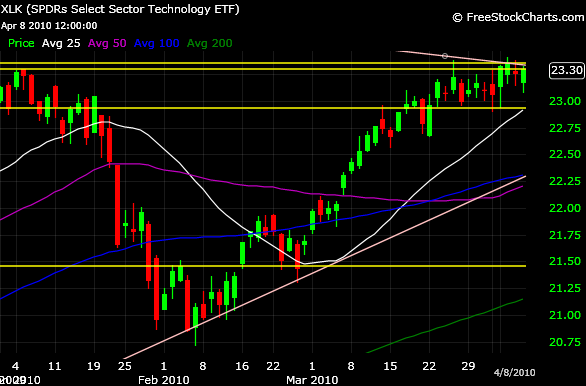 There is also long-term support from August 22 and 28, 2008 of 23.30 and 23.27, respectively.. The price of 23.00 even has played an important role. The 25d sma stopped descending on February 26 and bounced up. The 50d sma has leveled off and began to rise. The 100d and 200d sma's continue to ascend. The 25d sma has regained the 50d and 100d sma's. The 50d sma has not regained the 100d sma yet. XLK regained the 100d sma on March 1 and the 50d sma on March 4. The uptrend line, a rate of price ascent, is from the March 9. 2009 closing low of 13.22 up through the February 4, 2010 closing low of 20.86. The February 4 closing low has been the bottom for this 2010 pullback to date. The XLK has remained easily above this trendline since bouncing up above on February 5. The downtrend line, a rate of price descent, is from the October 31, 2007 all-time closing high of 28.40 down through the April 6, 2010 closing high of 23.35, the peak YTD closing high so far. XLK is just below this downtrend line. The RSIs indicate perhaps another YTD high before more consolidation and/or pullback. The MACD is bearish and has been hovering around the bull/bear 0 line since March 31. The lowest yellow horizontal line is the 10 month exponential moving average from the monthly chart, which I have overlayed on this daily chart. That is the line in the sand, so to speak, for the long term signal of a bear market. The XLK is above this signal at the current close, the second highest yellow horizontal line. XLK is battling to breakout upside to new 2010 highs. XLK set a new 2010 YTD high on April 6 and has stayed barely above the previous YTD high of 23.27 of 1-4-10. XLK has rallied off the low of February 4 but has stalled at or near the YTD highs. Many other stocks and sectors plus all the major indexes have set new 2010 YTD highs and exceeded them, XLK has not. The RSI 14 day is reasonable, the RSI 28d is overbought. The MACD is slightly bearish. I believe XLK will ultimately break through upside to new 2010 highs, but I'm disappointed it is taking so long. If and when this occurs and 23.80 is reached, a decent upside breakout could then occur. The intermediate-term trend is bullish. The long-term trend remains bullish.